This fantastic chandelier is currently on view in the Milwaukee Art Museum’s east galleria. It hangs there to represent the European collections in our reinstallation display–and I think that is does a great job! Lage Zwaluwe is a village in southern Netherlands. Because the chandelier is dedicated to a congregation, it probably hung in the village church. Since the 15th century, Lage Zwaluwe has had a church dedicated to St. John the Baptist Church. A seventeenth century church was destroyed in WWI, and the current church was built in 1951. So far, no more records related to the church have uncovered about the presentation or location. In addition, it can be challenging to find much information about the foundry of G.H. van Hengel, Jr. A “G.H. van Hengel en Zoon” (G.H. van Hengel and son) won an award for cast metal objects at the National exhibition in Haarlem in 1861. A church in Delft has a clock by the same company dated 1834. The Rijksmuseum has a ship’s bell in its collection from around 1854. Clearly, more research needs to be done on this! When confronted with a chandelier like this, it’s interesting to stop and think about the history of lighting interior spaces. Imagine having to light the candles every time it was used—and in a church there would have been many of them. Below, you can see a similar chandeliers in our painting of a church in Delft, Holland by Hendrik Cornelisz. van Vliet (Dutch, ca.1611–1675). Even then it wouldn’t be as bright as what we are used to with electric lights. It is reported that four hundred brass chandeliers were in the Cathedral in Antwerp alone—but the candles were so precious that they were put away in the daytime so they wouldn’t melt. Hendrik Cornelisz. van Vliet (Dutch, ca.1611–1675). Old Church in Delft, ca. 1670, Oil on canvas, 36 × 42 1/2 in. (91.44 × 107.95 cm). Milwaukee Art Museum, Gift of William and Sharon Treul M1999.81. Photo by Efraim Lev-er. Thinking of candles burning in our chandelier explains the drip trays that are integral to the design: to catch the candle wax. The next time you are in the Galleria, look up at it from below and notice the single hole in each drip tray. This would allow air flow in order to make the candle burn better and brighter. 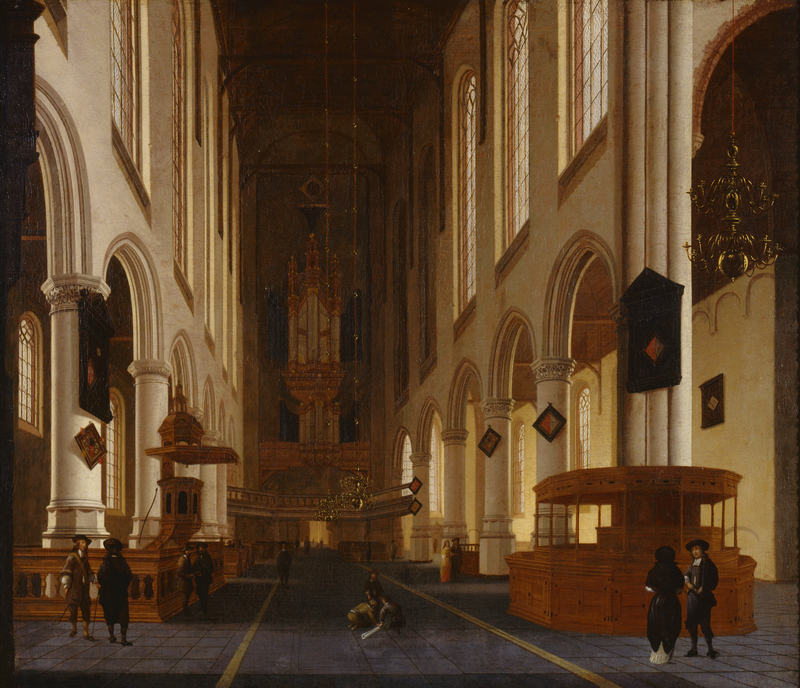 Dutch chandeliers are known for their simple elegance, most likely due to the unornamented interiors that were preferred by the Protestants (again, see the plain white interior of the church above). 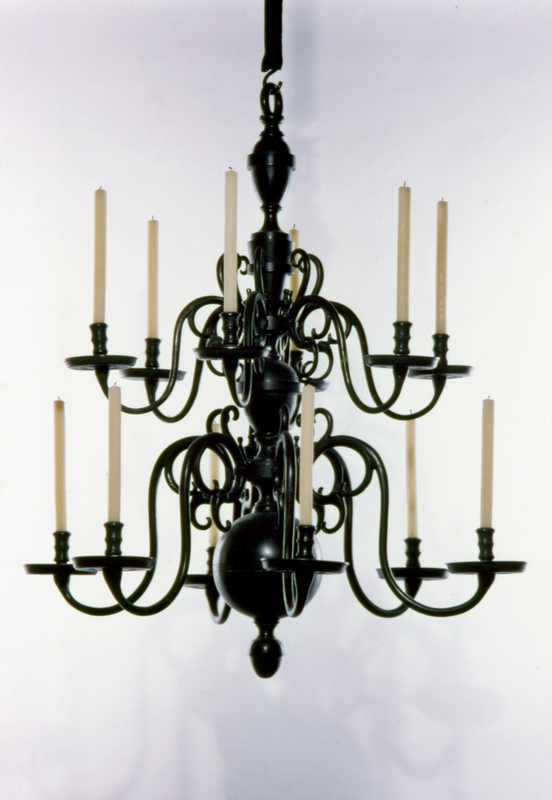 Although our chandelier has a dark patina, many have a polished finish which would have reflected the light. Dutch chandeliers have a relatively simple design aesthetic, especially when comparing it to a chandelier of 18th century France. French and Italian chandeliers included glass and crystal that would make the candlelight sparkle. Such a fancy style, however, would never do for the understated Dutch. The style of Dutch chandeliers has continued to be popular right up to the present day. We can still buy brass chandeliers that look just like the ones from the 18th century–I’ve even seen similar ones at Home Depot! This entry was posted in Art, Curatorial and tagged chandelier, dutch, European art. Bookmark the permalink.